In my blogging collaboration with my wife Dallis, usually what happens is that I write something and pass it along to her to see if she has photos to accompany my writing. She has a lot of photos, and the natural world and its creatures are among her favorite subjects. With this post, the process is reversed. 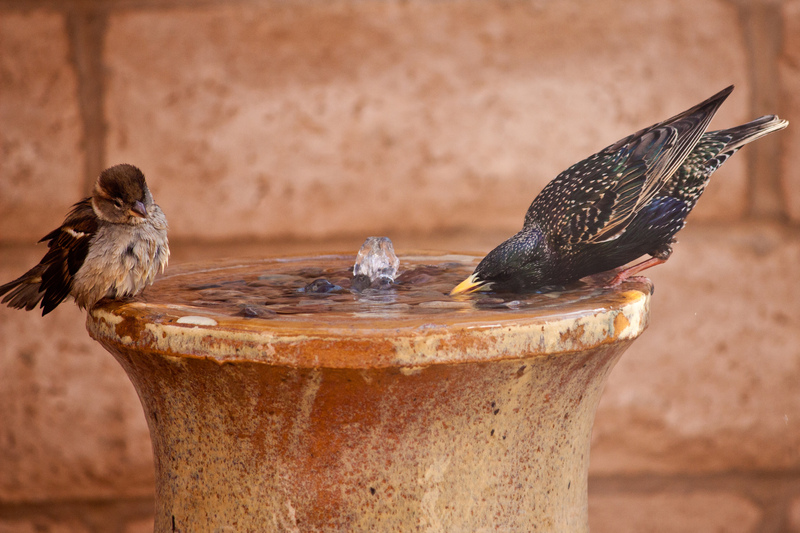 Dallis gave me a photo of some birds camped out at the fountain in our backyard, and my job was to write something. But I need your help. What do you think? Option A, B, or C? Cast your vote in the comment section below! You might even say why. Note: In the imaginary conversations below, little bird’s words are in italics! I choose A. Not sure why-maybe because it is positive and they are happy and grateful. I vote B because it made laugh and its good to laugh. I feel good, na na na na na na na! You know that I would now, na na na na na na na! …my vote is that you rotate — somewhat like a revolving door. One week it’s option A, the next weeks it’s B, the third week it’s C, and then you circle back around and start with option A again. James Brown, hands down. Like your collaboration! Then there’s Option D, which is how I interpreted the whole scene as I watched it appear before my very eyes, but I’m sorry; I can’t get the italics to work, so Option D is going to have to remain a secret! I’m hearing a lot of love for James Brown here. Sorry we don’t get a chance to hear Option D, which comes at the conversation from a whole different angle, so I’m told! I liked you B it was creative and outside the box, yet A is refreshing, simple, with a whole lotta soul for the ending!